“There and Back Again” It appears that the four intrepid intruders are members of a group called the “Party of Adventurers™”. 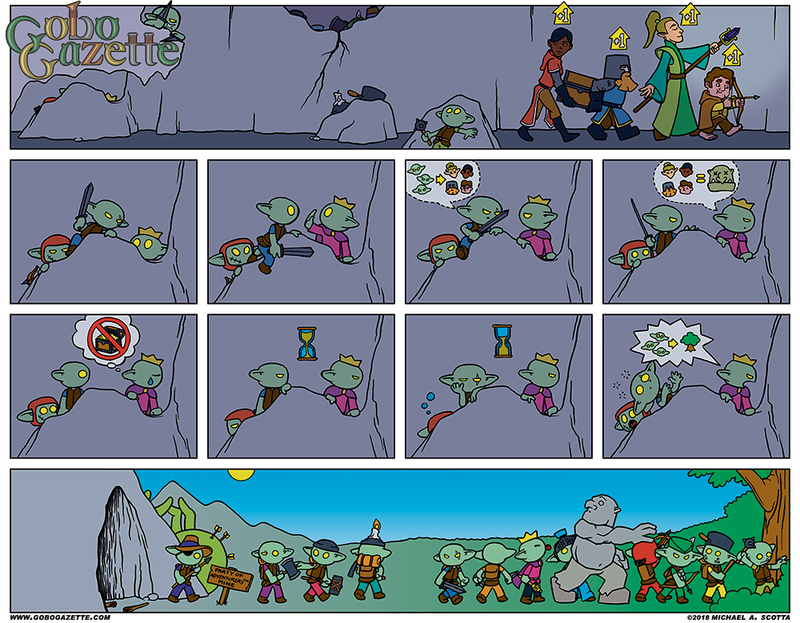 Not only have they leveled up on their adventure, they have laid claim to the emeralds in the cave! And they are making off with the chest of gold as well. This is quite a familiar scene for all of you gamers out there, specifically those that have played Dungeons & Dragons. Some of the gobos – specifically Nak – are all for launching an attack against these pilfering strangers. Nob, despite the loss of prized treasure, has opted out of that plan. This is probably for the best since they had eliminated their spider problem. And they scared their old boss straight out of the cave… and into the sunlight. Apparently this was a Tolkien troll because the cave now has a brand new monument on its front lawn. It is time for the gobos to head out of the cave once more. However, this time there is no parade, no fanfare. They have had a taste of the dangers that lurk outside and are now vigilant against whatever the wide world will throw at them.